Remember when you had only two choices in contact lenses? "Hard" (rigid gas permeable) lenses were best for crisp, clear vision, but were often irritating and uncomfortable. Soft lenses were the most comfortable, but often provided less-than-optimal vision. Now, a technological breakthrough makes having to choose a thing of the past. SynergEyes hybrid contact lenses offer the best of both worlds. The soft skirt offers all day comfort while the "breathable" rigid center keeps eyes healthy while providing crisp, clear vision even at night. Whether you have Astigmatism, need vision correction for distance, close up, reading or to help correct keratoconus, SynergEyes® contact lenses will provide you with comfortable and crisp vision. SynergEyes®, Inc., is a 21st century company, founded by a small group of industry and eye care professionals that recognized the market need for a better hybrid contact lens that combined the superior visual acuity of a rigid lens with the comfort of a soft contact lens. The revolutionary SynergEyes® hybrid contact lens with its rigid center and soft lens skirt, allows you to enjoy the best of both worlds; a stable, high oxygen permeable rigid center that delivers consistent crisp, clear vision with the all-day comfort of a soft contact lens. 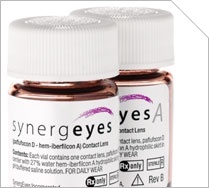 In September 2005, SynergEyes® received FDA "clearance to market" for the SynergEyes® A lens for patients with hyperopia, myopia with and without astigmatism. Over the subsequent six months, the company received market clearance for three additional lens designs - the SynergEyes® KC lens for patients with keratoconus, the SynergEyes® Multifocal lens for patients with presbyopia and the SynergEyes® PS lens for patients with refractive errors following corneal surgery and trauma. The SynergEyes® family of lenses fulfills the original goal of providing a solution that addresses the full continuum of vision needs while providing excellent visual acuity and all day comfort. No matter what type of vision correction you currently use, there's a good chance you're compromising on either clarity or comfort. With SynergEyes® there are no compromises. The SynergEyes® A lens is the perfect choice for patients with astigmatism seeking better vision and more comfort in a contact lens. 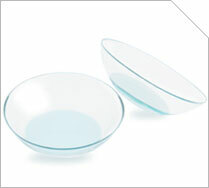 Soft contact lenses often compromise crisp vision while rigid lenses can be less comfortable and unstable on the eye. With SynergEyes® hybrid lenses, the "breathable" rigid center promotes corneal health and delivers high-definition vision, even at night, while the soft skirt provides comfort and stability all day long. SynergEyes® is free from "toric lens rotation", a common problem associated with soft toric lenses that causes inconsistent vision. SynergEyes® optics remain stable, delivering consistently clear vision, blink after blink. SynergEyes® eliminates the problem of irritating debris that can collect under conventional rigid lenses. And you won't experience the annoyance of rigid lenses moving when you blink or dislodging with your active lifestyle. At age 40+, even if you've never needed vision correction before, chances are you're beginning to find yourself holding books and menus at arms length. Until now, aging eyes have had to compromise their vision for the freedom of contact lenses. Now thanks to the new revolutionary SynergEyes® Multifocal hybrid contact lens you can experience ageless vision near and far. The unique hybrid design eliminates the instability and soft optics issues of other multifocal contact lenses. You'll never have to juggle multiple vision solutions, eyeglasses and bifocals, or bifocals and contacts, again. Eyeglasses or soft contact lenses may help correct vision in the mildest form of keratoconus. However as the disease advances, the cornea thins and continues to change into a cone-like shape, making it more difficult to fit with soft lenses or correct effectively with eyeglasses. 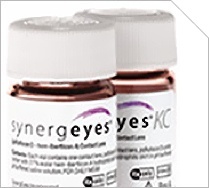 Every SynergEyes® KC lens is made to order to match each individual cornea. The "breathable" rigid center of the SynergEyes® KC lens promotes corneal health while providing the vision you need to improve your quality of life. 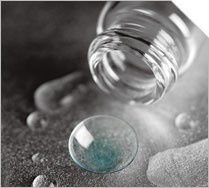 The soft skirt keeps the lens in place, reducing or eliminating mechanical rubbing and enhances your level of comfort, making this the perfect contact lens solution for patients with keratoconus. - SynergEyes® PS may be the answer you've been looking for! Ask us today if SynergEyes® PS is right for you! Each SynergEyes® PS hybrid contact lens is created using patented SynergEyes hybrid technology to deliver you the most advanced optics available on the market today. 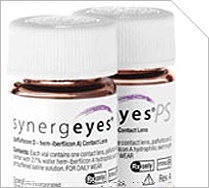 No other contact lens can offer you the unique benefits of SynergEyes® PS. We will custom fit SynergEyes® PS lenses to provide a solution for your individual needs. The soft skirt keeps the rigid portion centered on your eye and allows a layer of tears to form between your eye and the lens, correcting for the irregularities that cause blurry vision, ghosting and halos. And the "breathable" rigid center keeps your eye healthy while providing crisp, clear vision...even at night.